Our beautiful awareness ribbon jewelry will allow you to spread awareness about the causes most important to your heart while also wearing a beautiful piece. This subtle ribbon necklace can be used to promote awareness for any disease or cause that is important to you. This Aluminum Ribbon Charm Pendant measures 1.5”. It includes one Swarovski crystal in your awareness color or a freshwater pearl. Choose to display this beautiful pendant on an 18” silver-plated necklace, a heart key ring or a circle key ring. Free personalization of any name is included. 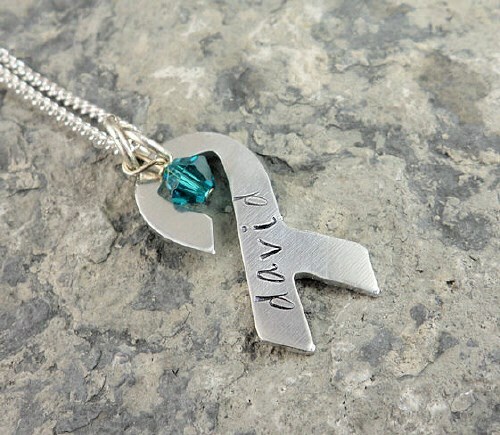 Additional Info This stunning awareness ribbon piece will look great on a key chain or as a pretty necklace. No matter how you choose to display it, you'll have a timeless accessory that will also make others aware of the passion you have for your cause. Our Awareness Ribbon Hand Stamped Necklace is another popular item we have.